8 HOW DO WE NARROW THE DIFFERENTIAL? 9 WHAT IS OUR THRESHOLD FOR DIAGNOSING THIS CONDITION? An abdominal aortic aneurysm (AAA) refers to refers to a localized pathological dilation of the aorta. It most commonly occurs between the renal arresters and the iliac bifurcation. AAA are thought to be most commonly caused by atherosclerosis in the setting of elevated blood pressure. Atherosclerosis can weaken the inner aortic wall, and as blood pressures increase this can lead to a loss of structural integrity, causing a dilation of this vessel. AAAs are often life threatening and can also be difficult to detect on a clinical workup (many are discovered incidentally). 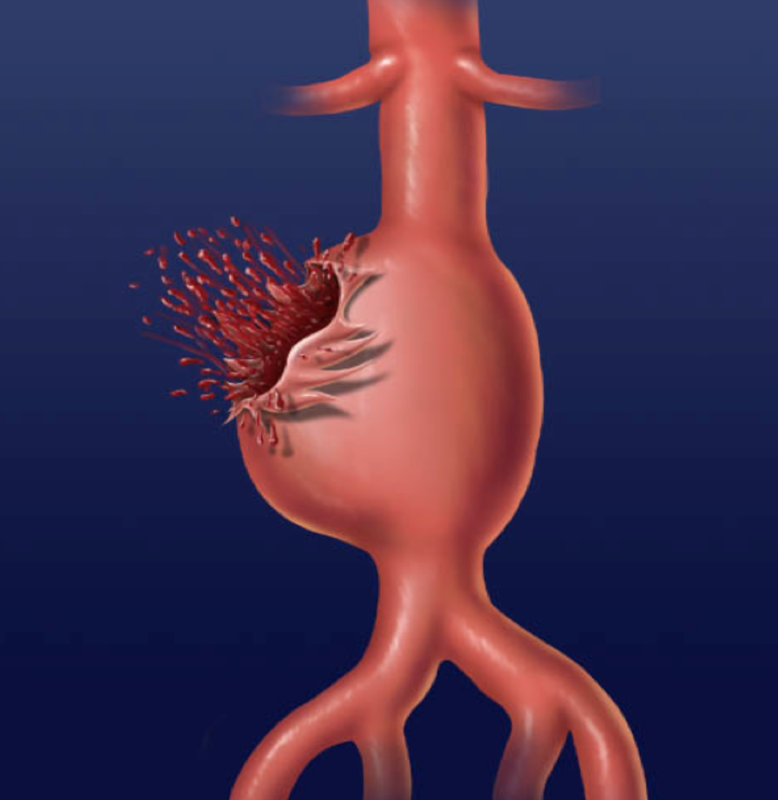 Because the area of the aneurysm has lost structural integrity, it can be at high risk for rupture. Given how much blood the aorta contains this type of rupture can be fatal. A large complication of a AAA is the chance of rupture which can often times be fatal (image source). Many patients with a AAA will rupture the aorta and a large percentage of these patients may die despite reaching the hospital. 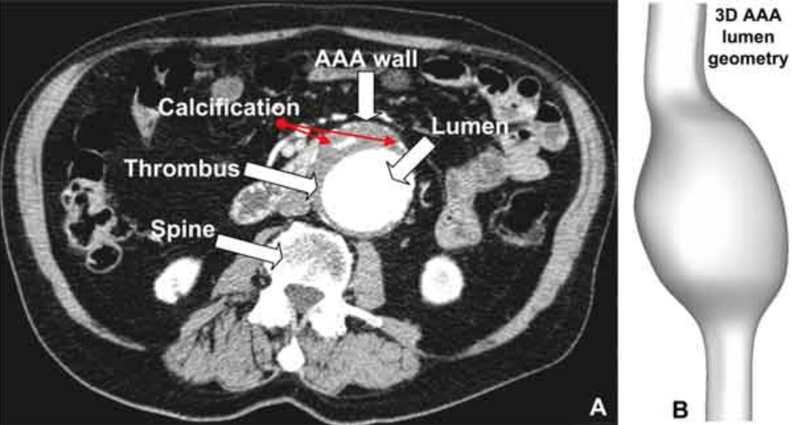 Dilated aortic aneurysm (>3.0 cm diameter) on abdominal ultrasound: a dilated abdominal aorta may be detected during a AAA ultrasound screening or a abodminla ultrasound that has been conducted for another reason. Asking specific questions to assess the above risk factors (such as smoking habits, past diagnosis of AAA in the family, known history of hypertension) can be important to evaluate when taking the medical history. The aorta can generally be visualized easily using on a transabdominal ultrasound study. Patients suspected to have a AAA can be screened with an ultrasound initially. 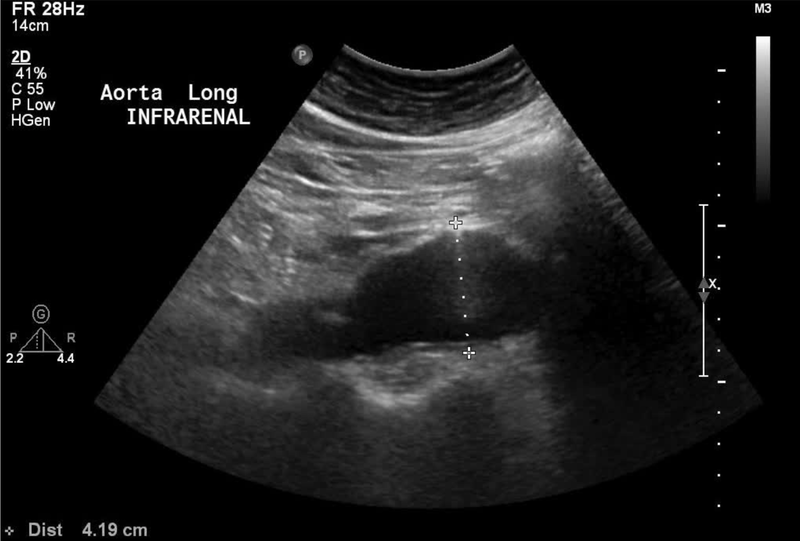 This abdominal ultrasound shows the aorta in the sagittal plane (long axis). There is a AAA present which is confirmed with a measurement that shows its diameter is above 3.0 cm in size (image source). The aorta can be very clearly visualized and characterized on an abdominal CT scan (especially in the setting of IV contrast). This axial section from a abodminla CT scan (with IV contrast) shows a AAA as well as other pathological features such as calcifications and thrombus formation (image source). 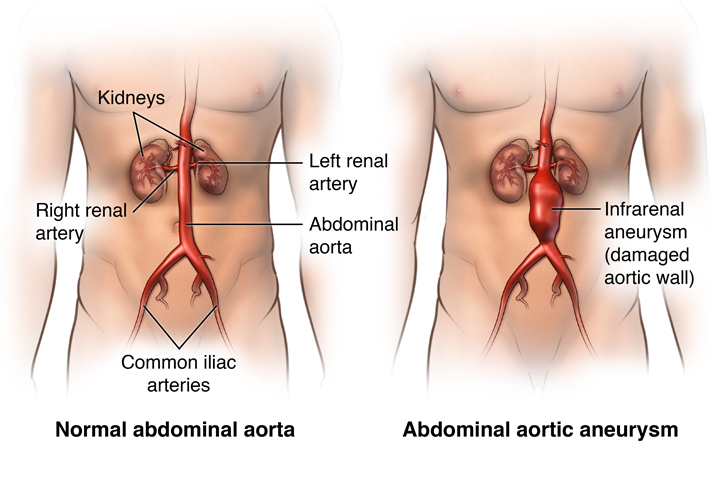 Patients who have an abdominal aortic diameter larger then 3 cm are given the diagnosis of a AAA (normal size is 1-3 cm). Patients who present with back/flank/or abdominal pain (all possible chief complaints) will have very large differentials to sort through. In brief abdominal imaging will be an important part of narrowing the differential when considering AAAs (specifically with ultrasound that can be done quickly to screen for a AAA). Not all patients with a AAA will require surgical intervention. An AAA that is greater than 5.5cm, an expansion of 1cm per year, or certain symptomatic patients should undergo immediate surgery. Smaller and stable AAAs (especially int he absence of symptoms) can be watched closely. There are various surgical/procedural options to consider when thinking about repairing a AAA. Small asymptomatic AAAs that are not expanding quickly are usually not managed surgically and are observed. This is most often by transabdominal AAA ultrasound screening every six months. The United States Preventative Services Task Force (USPSTF) states that anyone of the age 65-75 years old who have smoked cigarettes should be screened for a AAA with an abdominal ultrasound. Smoking cessation is a major part of prevention. As well as control of the major risk factors such as hypertension and heart disease, weight loss. A very special thanks goes to Ben Sinyor for contributing to this page.